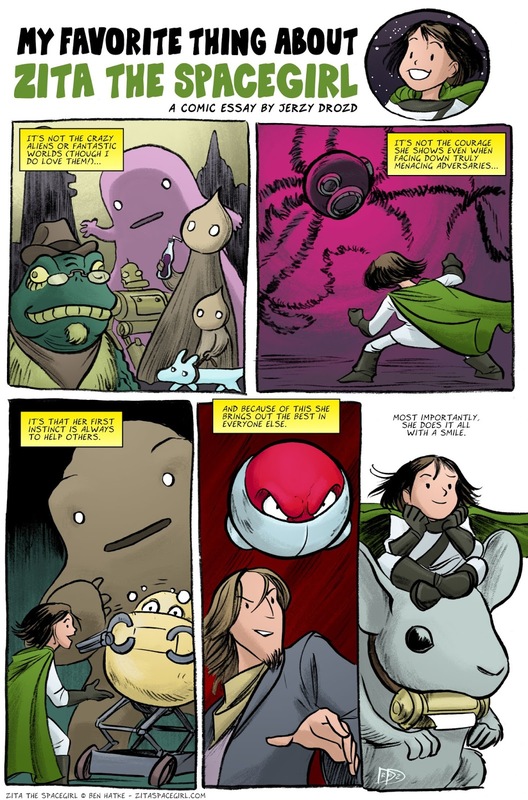 If you haven't heard yet, Ben Hatke's terrific Zita the Spacegirl series concludes with the release of The Return of Zita the Spacegirl, and a bunch of the series' fans are participating in a blog tour to celebrate! For my entry I decided to do a comic essay about my favorite thing about the graphic novels. I love smiling heroes. Guy Williams' Zorro. Christopher Reeve's Superman. Filmation's He-Man. For me they symbolize the notion that no matter how difficult the challenge or menacing the antagonist, we needn't let the situation's crumminess infect our worldview. They send a signal to their compatriots to rise above the threats facing them. And it's just fun to watch bad guys like Capitan Monasterio gnash his teeth with frustration when he realizes that he can't get under Zorro's skin. I'll buy the argument that smiling heroes can sometimes feel old fashioned or corny. That's another reason I'm so grateful for Ben Hatke's Zita the Spacegirl series. He's made that hero fresh and relevant again both for a new generation and for old guys like me who still love a hero who doesn't give in to despair, even when they have every reason to give in and quit (speaking of which, have you listened to my discussion with Ben on this very topic? It's a good one). If you're like me and enjoy a hero who confronts difficulty with courage and optimism, I think you'll enjoy Ben's Zita series a lot. You can also use it as evidence to shut down that friend who argues that smiling heroes belong to another era. In other words, buy two copies!